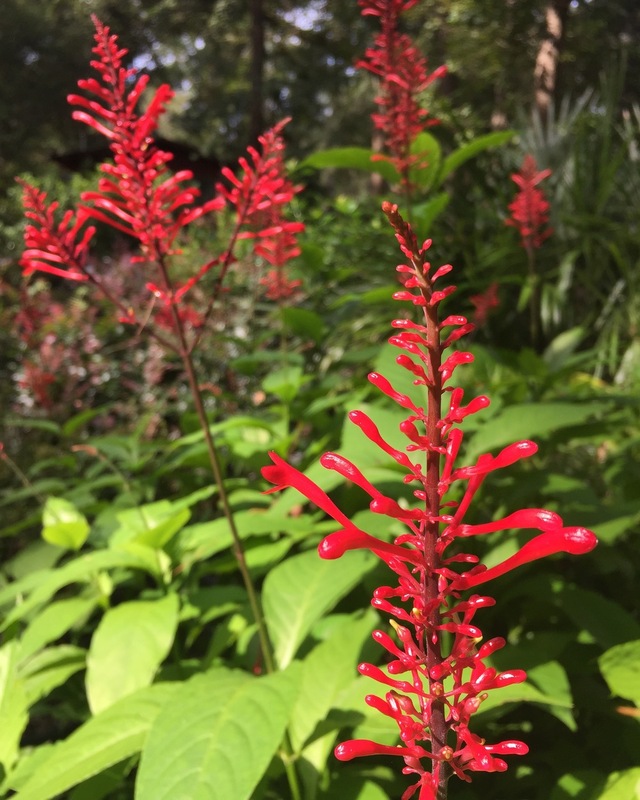 If you like hummingbirds and have a shady yard, you’ll love cardinal guard, also known as firespike (Odontonema cuspidatum). Its beautiful, crimson red flowers will brighten your shady nooks in late summer and fall – just in time to provide plenty of nectar for the hummers as they’re bulking up for their trip across the Gulf to their winter range in Central America and Mexico. With enough water, cardinal guard will grow in the sun, but we recommend it for shady landscapes. In its native Mexico and Panama, cardinal guard is evergreen and blooms all year. Here in Tallahassee, it is an herbaceous perennial. It dies to the ground each winter but sprouts again reliably in the spring. Plant it in good fertile soil. It grows in clumps, spreading by root suckers. The stems grow to four to five feet in height. The foliage is a beautiful, dark glossy green. Cardinal guard is easy to grow and mostly pest free. You may occasionally find mealybugs or leaf hoppers on them; but personally, I’ve never seen them infested to the point I would recommend any treatment. Let the birds and beneficial insects take care of this one for you. At Native Nurseries, we typically stock cardinal guard in 1- and 3-gallon pots. Currently we have both. As always, give us a call to check availability before making a special trip (although we’re always happy to see you). Sorry . . . we do not ship plants. NOTE – As you would expect, we here at Native Nurseries encourage you to use native plants in your yard and garden. When planted in locations that meet their requirements, they are well adapted to our climate and soils and have long established ecological relationships with the animals that share their habitats. We also carry some non-natives (such as cardinal guard) that are non-invasive, easy to maintain and serve a purpose.